I was thinking of my time spent in Cuba with the most beautiful believers I have ever met. They worshiped God like nothing I had ever seen before and they did it all with nothing. Most home churches in Cuba had no chairs, people either brought their own or they just sat on the floor. The government would not allow them to have any: instruments, music, loud speakers or microphones. Some of the youth would walk 2 hours just to go bring men and women to the services that were confined to a wheelchair. They would push them to the church and then take them all the way home again, rain or shine. All the while praising God for everything HE had given them, they were truly a family of GOD. Cuba is a place where Christians are still being persecuted, has no so called: Christian Orphanages, Christian schools, Christian Universities, Christian adoption agencies, Christian radio stations , Foreign Churches set up by rich American or Canadian Christian organizations, NGO’S and let’s not forget free food. Yet despite all this the gospel in Cuba is spreading like wildfire and the hunger for the HIM is immense. Now welcome to Haiti the land of plenty where there are more Christian missions and NGO’S (Non government organizations) per capital than anywhere else in the world. Billions and billions of dollars have poured into this place and what has the outcome been?From a worldly view it has been a great place for corrupt Politicians, phony aid groups, NGO’S, and yes even Christian missions to make allot of money. It is so typical of 3rd world countries, the rich making money off the backs of the poor. As Christians we need to look at what “our impact” has been on this Nation since we arrived. The first thing I must express to you is that “WE ARE NOT HERE FOR THE NEEDS OF THE HAITIANS, WE ARE HERE TO GIVE GLORY TO ‘HIS NAME ‘and HIS NAME only. Looking at what most of the mission groups are doing here I can see plainly that they have become crisis centered and not CHRIST centered. 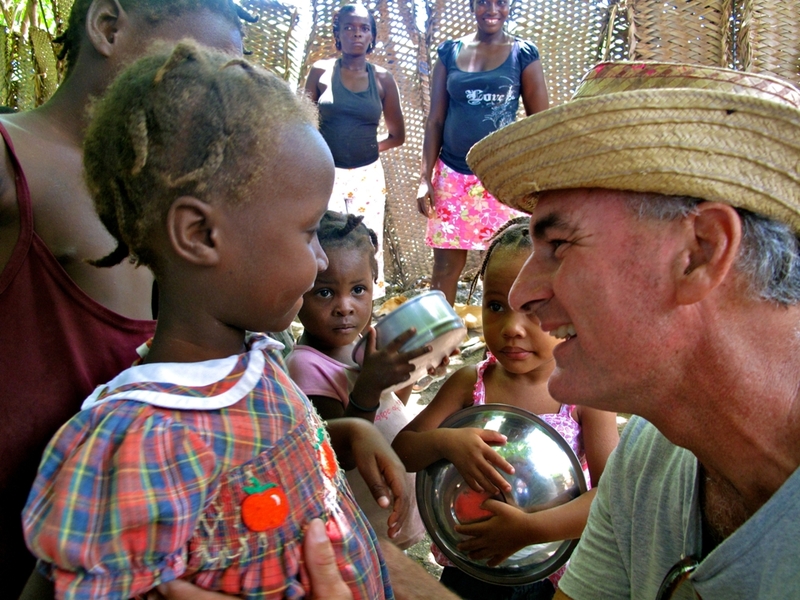 I’m sure when they first arrived they had the idea of bringing the gospel to every Haitian that would listen but after being here for a period of time they became so overwhelmed with the needs of the people they began to focus more on their physical poverty and less on their spiritual poverty. So now they have to build schools for the poor kids that aren’t able to go, build clinics for the sick that can’t afford the hospital, give out free food to the hungry and oh my let’s not forget all those orphans. I live in a town that has 5000 people and we have 9 so called Christian orphanages with more to come and guess what, 98% of these kids are not orphans. They have a parent that simply has given the child away because they cannot look after them, so why are these Christian groups calling them orphans when the fact is that most of them are not? Well you know what, I wanted to find that answer out for myself so I talked with a friend of mine who works at one of these warehouses. He is new to Haiti and a little green you might say so after telling him my views and concerns about these so called Orphanages he had a meeting with the pastor who was the director of the place he worked at. After a lengthy conversation, it is now called a Children’s home. Gee I’m glad there was some conviction there, that pastor might have been a real one. Now I’m not saying that schools, orphanages, clinics etc are bad but they are only fruitful if “CHRIST IS THE CENTER”. If you were to see the size of some of these orphanages and mission compounds and figure out what it must take to keep them operating, my goodness there is allot of GOD’S money being used just to keep these corporations operational. Because of this their focus can often become the mission and not HIM!!! As you know I sell coffee to most of the missions here in town as a way to help support our work. Each time they have a team arrive they allow me to come in and tell my story, but of course I’m edited and can’t tell them everything. Heaven forbid I tell them about the children I’ve known that were sacrificed in voodoo ceremonies, oh know lets just tell them about how many Haitians apparently got saved last month at their church and how everything is just rosy. I have spoken to hundreds of Brothers and Sisters that have come here on short term mission trips and I am amazed how naive they are. They have been coming here longer than me but because of the rules and regulations imposed on them by the mission, they know nothing about Haitians or what goes on outside that big wall surrounding their compound. Most missions do not even allow their Haitian employees to approach you; this was my experience when I first arrived here. Guys if you’re not allowed to speak to the Haitians or tell someone about Christ, then what are you doing here? I’ll tell you what you’re doing here, your cutting the grass, painting up some buildings on the compound, giving out free food that makes the Haitians dependent on you, building homes for Haitians while the Haitian workers watch you take their job away , welcome to the mission field. And oh boy you get to go home and tell everyone how you were so blessed to be on that trip and it has changed your life forever, then 2 months down the road you’re sipping on that Tim Horton’s coffee and your trip has become all but a vague memory. You were nothing more than a part of the growing industry that I call Missionary Tourism. So seriously guys, you must ask yourself if you go on a mission trip, what can I do to further HIS kingdom? How are you going to impact the spiritual lives of the people you will come in contact with? If the Mission group you are going with does not allow you to interact with the locals or give you a chance to lead someone to Christ, cancel the flight. A good Mission organization is not one that picks you up in an air-conditioned bus, gives you 3 meals a day, free internet, air conditioned rooms and has a lounge area for you to rest after working for them all day at their compound. No a good mission is one that “LEADS HEARTS DIRECTLY TO CHRIST”. You’re not going there to spread the gravel, you’re going there to spread the Gospel. If you look at most Mission compounds here in Haiti you would think that being a missionary is more about success than sacrifice. Okay enough of that, what needs to change? I can tell you that Haiti does not need another foreign mission, this country is living proof that “MISSION CENTERED EVANGELISM DOES NOT WORK it must be “CHRIST CENTERED”. They already have enough” Modern Day Profits” here. So let’s look at the world’s first missionary, JESUS himself. This guy walked for miles, took ships and rode around on donkeys much like the mountain people do here in Haiti. He had twelve good guys that more or less stuck by HIS side and everywhere they went they told everyone the good news. HE didn’t need a 5 acre compound to bring them to HIM; no HE went to them. Did he get 3 meals a day and the best imported steaks in town? I’m sure he didn’t. Did he stay in the places that had all the comfort? I don’t think so. HE was with the people and gave them what they needed, not like the groups here who give the people what they want. So now take this blueprint and duplicate it here in Haiti, no more huge compounds, no more 3 million dollar budgets that some mission organizations have, no more paying the fuel bills for the huge generator that keeps the lights on, no more maintaining the 26 vehicles owned by the mission and no more payroll for the foreign directors that run the mission from their comfortable offices back home. So what then? Easy, just a group of GOD fearing people that wants to see lives transformed and be devoted to HIM. People who care nothing more than to see HIS name proclaimed throughout the world, without all the gimmicks man thinks it takes to lead people to CHRIST. I want brothers and sisters that are actually concerned about their monthly gift, knowing that it is being used for HIS purposes. This is the group that I want to be a part of; I can tell you I can do more for the kingdom with $100 than most missions can with $1000. I will never bring a so called work team to this country; instead I will bring discipleship teams. The last thing this place needs is another group of Christian contractors. Everything we do has to have Kingdom value; feeding hungry kids without giving them the gospel is wrong. Sponsoring teachers at schools without the children hearing the gospel is wrong. Bringing anyone here without giving them a chance to share the gospel with a Haitian is wrong. So what kind of an investment is a good investment for the kingdom? To train and equip nationals with the tools needed for them to go back to their towns or mountain villages to disciple the people. As you may know this is something that I am working on right now. Do you want to go to heaven with a hand full of ashes or do you want to have crowns that we can throw at HIS feet and say “YOU ARE WORTHY”? Does HE not deserve the reward for HIS punishment. Hey, HE took our place on the cross, shouldn’t we at least be taking HIS place here?